A Pew survey of local news sources reveals the influence of social and mobile trends, along with a generation gap. The days of relying on a print newspaper and a television anchor telling us “the way it is” are long gone. In 2011, Americans and citizens the world over consume news on multiple screens and platforms. Increasingly, we all contribute reports ourselves, using Internet-connected smartphones. A new report on local news by the Pew Research Center’s Project for Excellence in Journalism and the Pew Internet & American Life Project provides reason to be hopeful about new information platforms. But the report also reveals deep concern about the decay of local newspapers, and what that will mean for local government accountability. Specifically, the report found that Americans rely on local TV for information about popular local topics, including weather (89% use TV for this information), breaking news (80%), local politics (67%) and crime (66%). Americans use newspapers for breadth and depth of many more topics, particularly with respect to local government information. Newspapers supply “broccoli journalism” about the least popular topics, including zoning and development information (30%), local social services (35%), job openings (39%) and local government activities (42%). These are topics that other local news institutions don’t often deliver. In the latest confirmation of the growth of the Internet in modern life, we’re increasingly going online when we’re interested in gathering information about specific local services, searching for information about education, restaurants, and business news, logging onto social media and accessing mobile devices to find and share what we learn ourselves. “The rise of search engines and specialty websites for different topics like weather, job postings, businesses, and even e-government have fractured and enriched the local news and information environment,” said Lee Rainie, director of the Pew Internet Project and another report co-author, in a prepared statement. Nearly half of adults (47%) now use mobile devices to get local news and information. The proliferation of smartphones, iPad apps and new platforms offers insight into a rapidly expanding mobile future. “We don’t yet know exactly how important mobile apps will be, but it’s pretty easy to sketch out a scenario where they rise in importance, especially when it comes to breaking news, weather, traffic, local politics and some of the more popular local topics,” said Rainie in an interview. Local housing and real estate. The websites of local newspapers and TV stations aren’t faring well, in terms of how the respondents rated their importance as a local news source. “Local TV news websites barely registered,” reads the report, with less than 6% of those surveyed indicating that they depended on a legacy media organization’s website for local news. While the report showed that citizens don’t rely on social media for local news, they are definitely discussing it there. “Participatory news” is a full-blown phenomenon: 41% of respondents can be considered “participators” who publish information online. That said, such information is frequently about restaurants and community events, versus harder news. Web 2.0 Expo New York 2011, being held Oct. 10-13, showcases the latest Web 2.0 business models, development tools and design strategies for the builders of the next-generation web. A generation gap could have profound implications for how informed citizens can be about their communities in the future, based upon their consumption habits and the availability of information. Veterans of local news operations know that reality well. “This is something that I faced way back when I was at The Molokai Times in Hawaii,” commented Kate Gardiner, responding to a question on Facebook. Gardiner is a new media strategist that works with Al Jazeera, Lauch and the Poynter Institute. “We built a very robust online community to complement the hard copy and were experimenting with ways to make things even better for everyone — until the bottom dropped out and our major advertiser went bankrupt. The whole newspaper died. The community (about 5,000 people) was left with no alternative means of consuming news. Our competition sort of stepped up, but they weren’t doing straight news. It’s a problem on any number of levels — and there’s no really obvious way to do a community-funded replacement, online or off. Given that context, do these findings add additional urgency to funding and creating new models for information aggregation and distribution online? 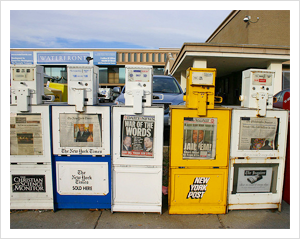 As print fades and a digital future for news becomes more equally distributed, establishing sustainable local online information hubs to meet the information needs of our democracy will grow in importance, along with the means to connect those news sources to communities on the other side of the digital or data divide. Simply put, there’s an increasing need for local government news to be generated from civic media, libraries, schools, institutions and private industry. New platforms for social networking and sharing still need to be supplied with accurate information. … 3% of adults said that they rely on their local government (including both local government websites or visiting offices directly) as the main source of information for both taxes and for local social services, and even fewer cite their local government as a key source for other topics such as community events, zoning and development, and even local government activity. The results of the survey leave us with significant questions and, unfortunately, few answers about the future of news in rural areas and towns. While local TV stations can focus on their profit centers — weather, breaking news, crime, traffic — it’s going to be tough for local papers to monetize the less popular but important coverage of civic affairs. “But if newspapers cut back on coverage of local government because it is expensive and doesn’t pay for itself with lots of advertising, then local government information will be harder to come by,” said Rainie. What these news consumption trends mean for local governments, in terms of getting information to citizens when and where they need it, is more difficult to judge. Steve Coll published an article in the Columbia Journalism Review prior to Waldman’s that provided a thoughtful series of recommendations to reboot the news. Notably, the Federal Trade Commission also has recommended publishing public data online to support the future of journalism. There is no shortage of creative ideas for the digital future of journalism, as evidenced by the conversations and new projects generated by the dynamic community that came together last weekend in Boston at the Online News Association’s annual conference. The challenge is that many of them supply information to digitally literate news consumers with smartphones and broadband connections, not the poor, undereducated or disconnected. If local newspapers go away and local government information all goes digital, with primary access through mobile devices, what will it mean for the 21% of Americans still offline? In addition, will being poor mean being uninformed and disconnected from local civic life? Past PEJ studies have found that local newspapers typically have 70 to 100 stories a day. The typical half-hour local TV newscast is closer to 15. So it is logical that newspapers would offer coverage of more topics in a community, while television might concentrate on a more limited number that attract the widest audience. The Pew report found that citizen-produced information (e.g. newsletters or listservs), commercial websites and newspapers all outweighed local government as news sources that readers relied upon. In that context, the work of e-democracy.org and other civic media platforms will be critical. There are a growing number of free or inexpensive web-based tools available to city managers, including a growing repository of open source civic software at Civic Commons. Another direction lies in the use of local wikis to connect communities. Libraries will be important hubs for rural communities and will be a core element of bridging the digital divide in under-connected communities. Listservs will play a role in connecting citizens using the Internet’s original killer app, email. Platforms for participatory budgeting may be integrated into hubs in municipalities that have a tolerance for ceding more power of the purse directly to citizens. Many forward-thinking local governments will provide the means for citizens to obtain information by using the most common electronic device: a cellphone. Arkansas, for instance, has added question and answer functionality to mobile apps for citizens using text messaging. The increasing use of these tools by local and state governments has created a niche within the burgeoning “Gov 2.0 field,” which now covers enterprises from participatory policy making to 311-systems. Although newspapers have been slower to employ these online engagement platforms, several interesting initiatives launched by newspapers from the San Francisco Chronicle and its water shortage game to the Washington Post’s city budget balancing tool indicate that news organizations are beginning to take the lead in online public participation. This can be seen as both good and bad. On the positive side, these tools are interactive, allowing a new and participatory form of learning for participants. Matched with the popularity of online games in general, these online civic engagement platforms can create a real “win-win” for both news organizations and users alike — informing readers and driving precious online traffic to newspaper websites. The way to build the most effective online engagement platforms is for news organizations and local governments to collaborate from their strengths: newspapers bringing their informed readership and marketing skills, working with a municipality’s budget and policy experts. Of course, these relationships demand both transparency and a lack of bias — qualities neither party is known for. But — and this may be hardest of all — these tools also need citizens who are both engaged on local issues and humble about the challenges of forming public policy. The growth of a new digital news ecosystem populated by civic media, an evolving civic stack, and data journalism will generate some answers to these questions, but it won’t address all of the outstanding issues. When I asked for feedback from readers on Twitter, Google+ and Facebook, I received a wide range of responses, some expressing serious worries about the future of local journalism and a few that were hopeful about the potential for technology to help citizens inform one another. A number of people discussed new public and private ventures, including Patch.com, AOL’s initiative to fill the gap in local news, and NPR’s Project Argo, which is experimenting with regional news coverage through public radio. Many years ago the early trend in smaller markets was loss of local ownership of both print and broadcast news sources, an event that leads to a focus on financial performance first, rather than the financial success that follows from producing a quality product. More recently the advertising dollars necessary to sustain local journalism have tended to flow away from local journalism outlets to the additional delivery mechanisms, including “shoppers” (those go way back), electronic (direct email, blogs, coupon or deal sites, shopping help sites with reviews and price comparisons, etc. ), movement of advertising to regional radio and TV, not to mention the loss of local sales to online merchants. This shift away from local journalism can also be seen in the journalism schools, where students are much more interested in journalism with perceived better financial prospects. That there can be substantial non-financial benefits to living in small cities and towns, i.e., quality of life, seems of less importance. I fear losing the judgment, ethics, and dedication of small-town journalists will lead to a slow deterioration of the quality of local government, a reduction in the quality of life due to a lack of balanced reporting (as well as editorials) of local issues, and in too many places a return to the civic leaders in the “smoke-filled room” making decisions for the uninformed. If states are the laboratories for democracy, towns and cities may be the Petri dishes that stress test the vitality of different species of online hubs. The ones that will stick around will have met the information needs of citizens better than the alternatives — or they’ll have found sustainable business models. In an ideal world, they’ll have both. Appropriately, the conversation around the Pew report continues on a variety of online forums. If you have any thoughts on what’s next, please feel free to share them in the comments here or on Google+ and Facebook, and via the #localnews hashtag on Twitter.